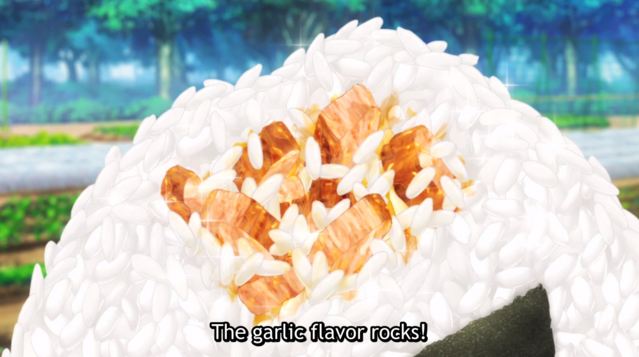 April Fool’s Onigiri inspired by Food Wars! It’s my favorite time of the year: April Fool’s! Last year we made the mighty WcDonald’s burger, and this year I really really really REALLY want you to make these Russian Roulette onigiri. They’re multi-effective. Use them to trick your friends—you can pretend you made some delicious onigiri to share with everyone and then watch and laugh as they run, screaming, to vomit in the sink (no, of COURSE this didn’t happen to ME, you fools, I am STRONGER than other mortals!). Or you can play a good, old-fashioned Russian Roulette, where you take turns picking mystery onigiri and celebrating, or lamenting, depending on what you choose. 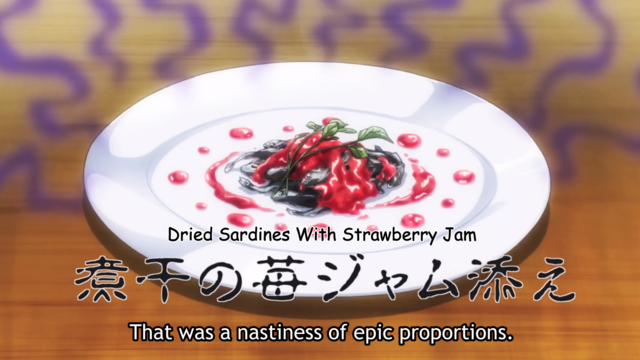 The inspiration here comes from Food Wars!, and Soma and his father’s truly horrendous creations—peanut butter squid and strawberry jam sardines. I thought it would be fun to turn these into onigiri fillings and see what happened and boy oh boy….well…just watch the video below. It isn’t pretty. On the other hand, I felt we needed one great onigiri, to truly offset the misery of the other two fillings, and Megumi’s pure and beautiful creations came to mind. Among other flavors, she has a delightful garlic pork recipe that looked truly captivating. I thought it would be fairly straightforward to make, and the recipe I came up with is just that—it took me less than ten minutes to throw together, is really tasty, and is gluten-free, to boot! If you take nothing else away from this article, I hope it’s the recipe for the garlic pork, because it’s really excellent. Megumi knew what was up when she made this for everyone at Polar Star dormitory. In any case, I hope you enjoy this recipe! It’s fun to try the different food combinations, even if they are mostly horrible. In the video below, you can see our reaction to the onigiri and get a sense for yourself exactly what we sacrificed to try them for you. Have a happy April Fool’s Day! Watch the video below for step-by-step instructions! -You will also need freshly cooked rice and nori sheets for wrapping the onigiri. 1. Start your rice cooking so it’s nice and hot by the time you’re ready to make your onigiri. 2. In a medium pan, dump in your pork belly. Cook until browned, and season with salt. Remove from the pan and set aside, leaving the drippings in. Sautee garlic briefly, until fragrant, then deglaze the pan with 2 tbsp sake. With a wooden spoon, scrape up any brown bits. Then, add in miso and honey, stirring and mashing until it all comes together. Add more sake as necessary to loosen up the glaze. Then, toss pork belly back in, toss to coat, and remove from heat and set aside. 3. Mix strawberry jam and chopped sardines together. Set aside. 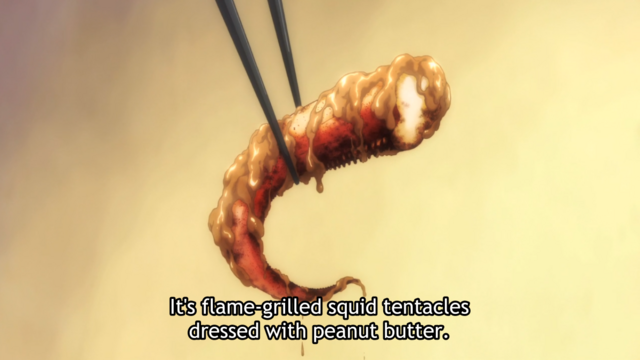 Do the same for the peanut butter and squid. 4. Form your onigiri! I made two of each. Use a mold, fill halfway with rice, and make a circle in each for the filling. Pack with more rice, and squish together. Use a nori stip to make a little handhold for the onigiri, and set on a plate. 5. Scramble the onigiri on the plate, and play a little game of Russian Roulette with your friends! Or pack a ~special~ lunch for your kids. Or leave these out for a co-worker to find! Previous Post Strawberry Shortcake from Kaguya-Sama: Love is War! I love watching your Penguin Snacks. You are so talented! Love you too! Thank you for your comment 😀 I am very excited!